September 23, 2014. 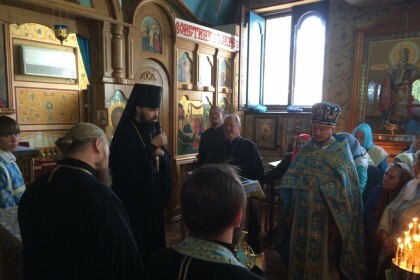 Archbishop Mitrophan of Horlivka and Sloviansk celebrated the Divine Liturgy at the Church of the Nativity of the Most Holy Theotokos in Horlivka on September 21. The press office of the Horlivka and Sloviansk Diocese reported that a procession took place around the church following the Liturgy. “There are things that we cannot understand until we experience them. When we had peace we did not value it, or rather we took it for granted. Since our schooldays, we have celebrated Victory Day (May 9) and heard that peace is the most crucial thing. However, we did not understand what peace was, because we had always had it since our birth. And nobody was taking it away from us. But today, when we do not have peace, we understand how happy we used to be. “Imagine how people anticipated the Savior coming to this world. Before the Fall of man, people did not know how to live without God. However, when they lost Him and were expelled from Paradise, they saw that everything was not as simple as they had thought: sometimes storms occurred, there were wild animals, hostilities began, and other ‘delights’ of a life without God, due to which people lose their orientation and the meaning of life. People wished somebody could give everything back to them.